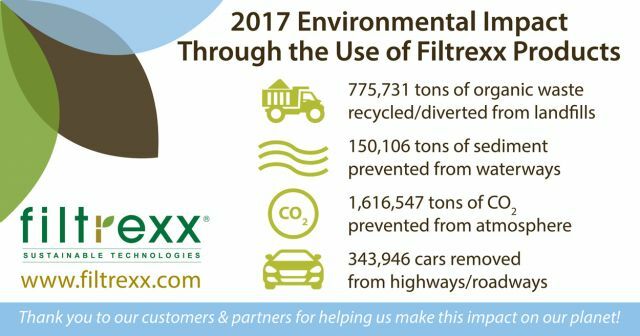 Akron, Ohio (March 2, 2018) – Filtrexx International, a leading developer of Sustainable Management Practice (SMP) solutions, announced this week the statistics on how their SMP solutions impacted the environment in 2017. This included SiltSoxx™, EnviroSoxx®, LivingWalls™, GroSoxx®, compost blanket and Filtrexx Mesh applications. 343,946 cars removed from highways/roadways (equivalence to CO2 prevented). The message Filtrexx is driving is that they are more than a product and service company. EcoPractices, a third-party partner, will be generating a Filtrexx 2017 Sustainability Report coming soon. Contact Filtrexx to learn more on calculating your own environmental impact through the use of Sustainable Management Practices at info@filtrexx.com or 877-542-7699.